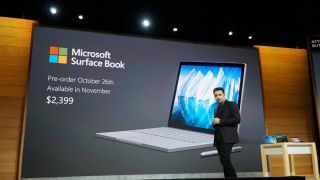 A keynote by Panos Panay, Microsoft’s Surface head of product, will be delivered at the company’s London-based Future Decoded event, reports Microsoft insider Tom Warren of The Verge. When will it all go down? Future Decoded runs October 31 through November 1, and it appears Panay will speak on the 31st. One option posited by Warren is the LTE version of the Surface Pro. Microsoft already announced a Surface Pro with LTE is on the way, and it's supposed to launch later this year. Future Decoded could be when we learn details of the always-connected tablet's release date and price. Finally, there's a chance Panay could unveil Surface products running ARM chips, including those with SoCs (System on a Chip) produced by Qualcomm. Microsoft and Qualcomm announced during May's Computex conference that ARM-based Windows 10 devices produced by Asus, HP and Lenovo are on the way this year. These PCs will run on Qualcomm's Snapdragon 835 platform and be slim, lightweight and fanless. What's more, the devices will have LTE support in addition to the full Windows 10 experience.